Television Maribor is part of RTV Slovenia and a part of the Regional RTV Centre in Maribor. 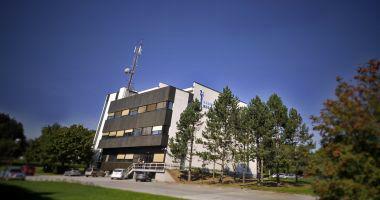 Its origins date back to 1968, when the first professional correspondence unit for TV Slovenia was set up in Maribor. The date September 23, 2002 was a new turning point for TV Maribor – television began to broadcast its own all-day television program. An important part of our program is represented also by our associates at the television studio in Lendava, as they prepare for the regional programme broadcasts about the life of the Hungarian minority in Slovenia – Mostovi or Hidaki (Bridges). In Maribor, we are very proud of the advisory programmes, which we prepare for the national program. Already for 55 years the agricultural program Ljudje in zemlja (People and Land) has been produced in our studio; somewhat younger is the gardening programme Na vrtu (In the Garden). Animal lovers do not miss our programme O živalih in ljudeh (About Animals and People), which also touches on relationships between different creatures on Earth. Colleagues in the cultural office prepare the programme Glasnik (Messenger); with the support of European Union productions the programme Evropski magazine (European magazine) is produced, it deals with ecological problems, health, green energy, problems of unemployment...; the programme Slovenci po svetu (Slovenes around the world) monitors stories and accomplishments of Slovenes abroad. We are also proud of our news programme, whose contributions enrich all national informative programmes. We start work in our studio in the morning, because we co-create the national morning show Dobro jutro (Good Morning). At Television Maribor approximately 80 people prepare about two hours of regional programme. The regional programme is created in two modern studios and consists of regional news –Dnevnik Televizije Maribor (Daily News Television Maribor), topical discussions and contact programmes – TELE M, entertainment programmes Koktajl (Cocktail) – a programme about sports, and Sportni Kompas (Sports compass) and broadcasts which we prepare for the national programmes. Along with all the above, we also make documentary reports about amateur culture; we are also proud of the documentary films created by our fellow colleagues. Particularly well received are films about Slovenian sports legends. The film about Slovenia's famous Olympian Leon Štukelj and the film about Slovenian ultra marathonist Ruth Reš Podgornik, who completed the brutal Spartathlon in Greece, have also received awards abroad. With the production van we cooperate in the transmissions of sports events (also football matches, with Maribor's football team play in the European League). The production van is also used to record concerts, masses and many other events. .
Our programs and shows are also visible on the Web.